- Publisher This new series by author Rebekah Montgomery directs readers to the Source of true love, pure joy, perfect peace, and unending faithfulness. Inspiring stories, memorable quotes, relevant Scriptures, and practical tips are offered to help readers cultivate the fruit of the Spirit in their lives -- by transplanting themselves into God's tender care. Only through His Spirit are we able to grow this special fruit in our lives and pass it along to others who hunger for God. 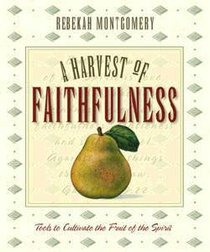 About "A Harvest of Faithfulness"
This new series by author Rebekah Montgomery directs readers to the Source of true love, pure joy, perfect peace, and unending faithfulness. Inspiring stories, memorable quotes, relevant Scriptures, and practical tips are offered to help readers cultivate the fruit of the Spirit in their lives -- by transplanting themselves into God's tender care. Only through His Spirit are we able to grow this special fruit in our lives and pass it along to others who hunger for God.